Most western nations advance the clock ahead one hour during the summer months. Americans call this period Daylight Saving Time. Benjamin Franklin originally suggested the idea. He wanted to take advantage of the additional daylight time in the summer when many people were sleeping. 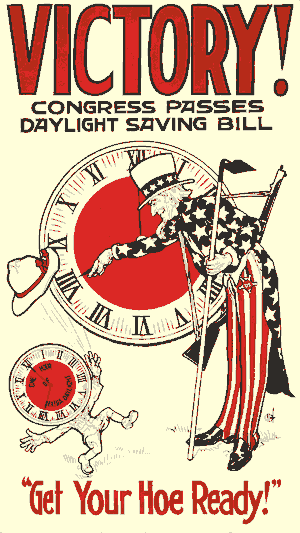 The United States temporarily adopted Daylight Saving Time in 1918. America was fighting World War I, and American leaders concluded that the additional hour of daylight would save fuel needed for the war effort. The war ended, so the national experiment lasted only one year, but many states continued to observe Daylight Saving Time on their own. 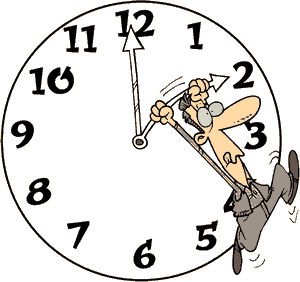 Congress set the clocks ahead again in 1942 during the Second World War and again during an energy shortage in 1973. In addition to energy savings, many retail business owners favor Daylight Saving Time because it allows more daylight hours for shopping. There is also some evidence that suggests that additional daylight contributes to fewer automobile accidents and a decrease in violent crime. In the United States, every state but Hawaii and Arizona observes Daylight Saving Time from the second Sunday in March to the first Sunday in November. Hawaii is closer to the equator than the other states, and since the amount of daylight does not vary much, the Hawaiians feel Daylight Saving Time is unnecessary. Summer temperatures in Arizona often reach 100o, so lawmakers in the Grand Canyon State decided it would be better to end the day early so Arizonans could enjoy an extra hour of cooler evening weather in the summer. Daylight Saving Time was first adopted to replace artificial lighting so they could save fuel for the war effort in Germany during World War I. This poster reminds farmers that the extra hour of daylight will provide more time for farming. When will Daylight Saving Time Begin and End in the United States?